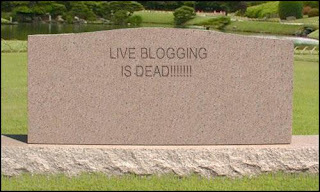 Live Tweeting has replaced Live Blogging, if it wasn’t already obvious. I can’t remember if it was the latest Jobs MacWorld Keynote where it became apparent (because Twitter was much faster than MacRumors) or if was during one of the 25+ debates this past election season … all I do know is that Twitter has replaced blogs for instant information. It has ceased to be a microblogging platform. Twitter has become a macro-messaging dashboard. Whether it is finding out the new relationship between SalesForce and FaceBook, the trade of Allen Iverson, or the untimely death of Tim Russert, information is being learned on Twitter more than any other medium. For it to make it to Twitter, it very often has to be broken by a (hopefully reputable) source first … but once that link exists, the chances of it going viral (assuming it deserves to go viral) is greater. Is Twitter even faster than Digg now? That answer is definitely YES. While I wasn’t the biggest advocate of Twitter for a while, this particular use of the platform is transformative. I started doing this because I had a very surprising experience at an agency. There is a small firm in downtown NYC that pretty much exploded in laughter when I pulled up the screenshot of twitter. So we went around the room and asked everyone what they thought? The words that were thrown out were: ridiculous, crazy, boring, waste of time, bird, etc. I don’t remember anyone in those events saying journalist, influencers, instant messaging, conversation, etc. I’d love to be able to do it now, but due to time I’ll have to save my, “Why Twitter is Important” post for later and just point you towards HubSpot’s solid tome. UPDATE: The untimely and unfortunate death of Barack Obama’s grandmother was spread on Twitter only seconds after it was broken on MSNBC and beat Reuters, CNN, Marketwatch, etc. to the news. It also beat Digg by a mile. I’m very saddened by the news and hope it doesn’t come across as callous.